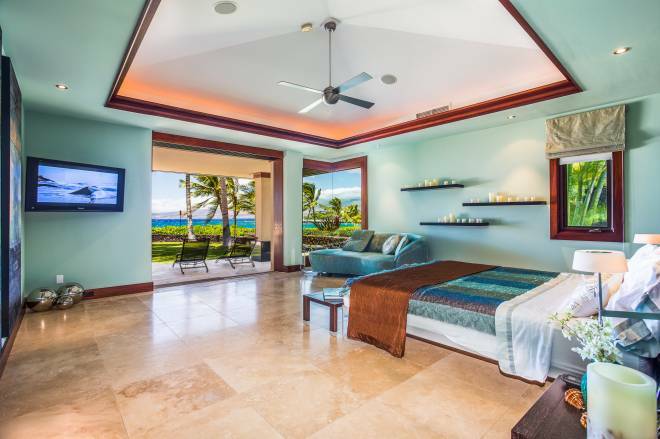 Beachfront Pauoa Estate – Luxury Vacation Homes, Inc.
An amazing oceanfront luxury estate where your vacation begins on the water’s edge. 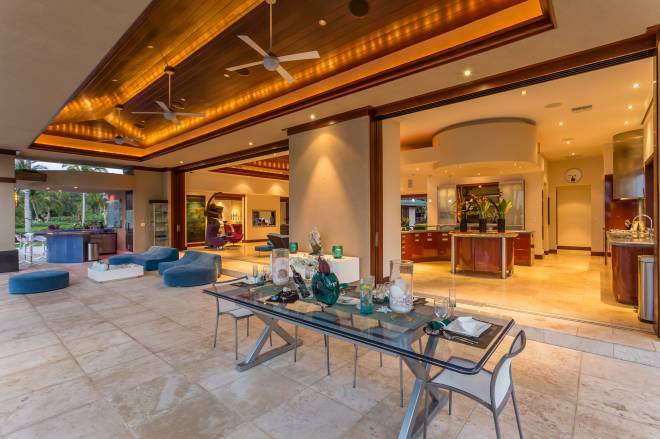 This very large and open contemporary home is as close to the water as you can get on the Big Island, on the beach and under the palm trees. This 4 bedroom, 4.5 baths estate on 1.34 acres, enjoys 300 feet of ocean frontage and sleeps 8 comfortably. The estate is an ideal location for family reunions, wedding parties, anniversaries, special birthdays and other celebrations. 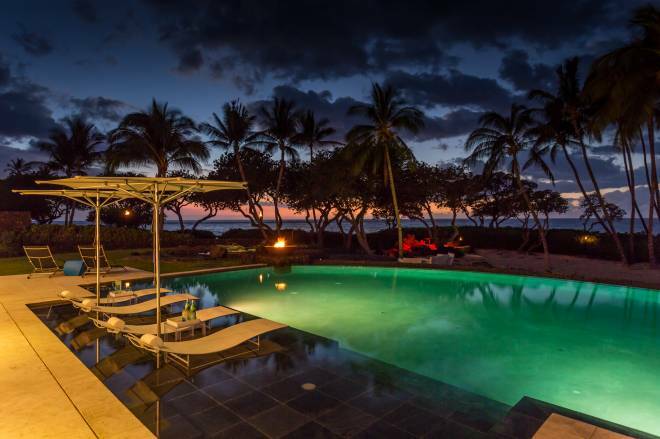 Ask us about special events. This estate is literally 50 feet from the ocean and from the home you enjoy 180-degree views of the ocean and Kohala Mountains. In winter months, watch and admire whales and dolphins swimming nearby. 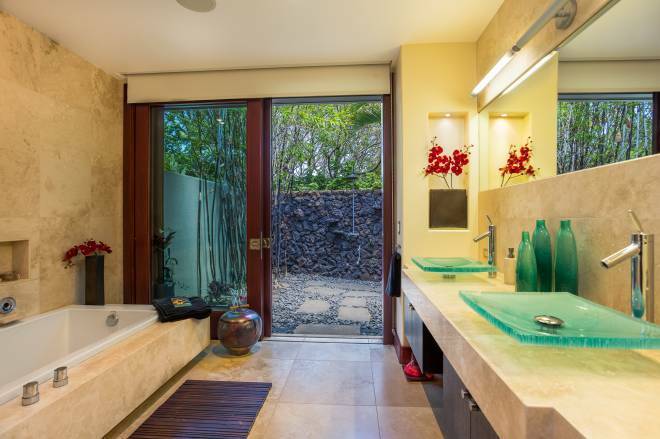 The home is completely furnished for a modern contemporary lifestyle, with comfortable seating throughout. 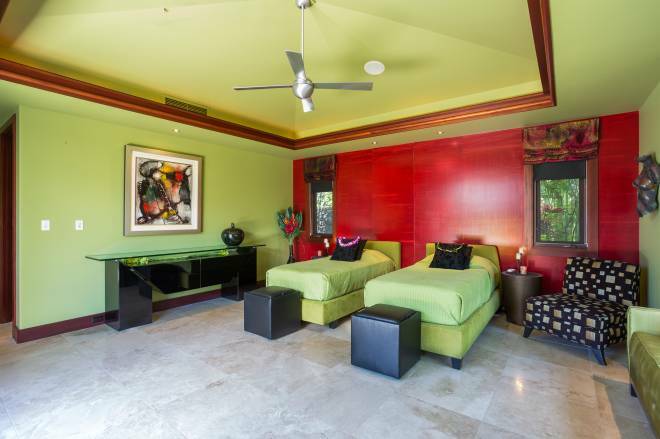 Every room has a number of original work of art. 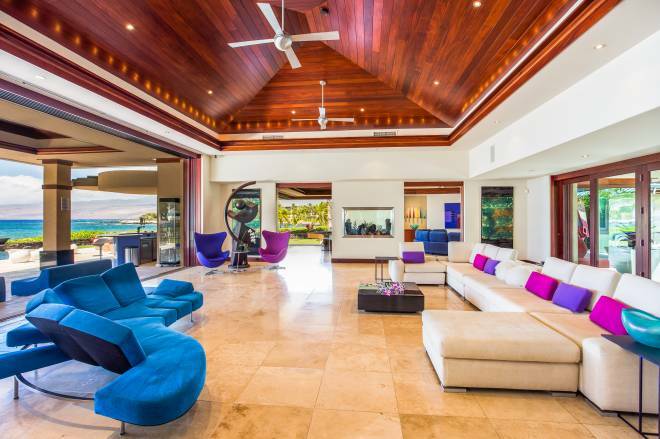 This house is designed for easy carefree living with vanishing mahogany doors, opening to magnificent ocean views and sounds to thoroughly enjoy your Hawaii vacation. The 12′ mahogany doors slide away creating an oasis of indoor and outdoor living. 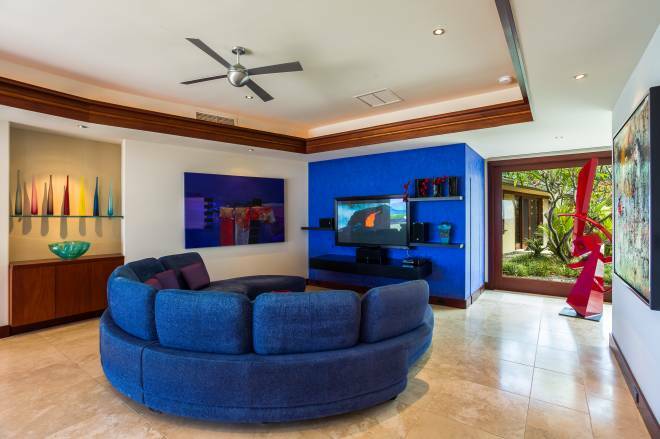 The estate is a smart house, with Lutron lighting system, 7 large flat screen TV’s in every room, along with indoor-outdoor surround sound music system. The Gourmet Kitchen is a chef’s delight! Imagine prepping and cooking your meals on a Miele gas cooktop with views of the ocean and pool and every thing you need readily available. The kitchen was designed to take advantage of the views so you won’t miss out on anything! There is also a butler’s kitchen with plenty of pantry storage. Kitchen includes two full Subzero refrigerators with dual freezers in kitchen, refrigerated vegetable crisper, and 40 bottle wine cooler. Dual Miele dishwashers for fast dinner cleanup. Hear the ocean waves wash ashore while relaxing in the huge 56′ infinity pool with nearby heated lava spa with warm sand entry. 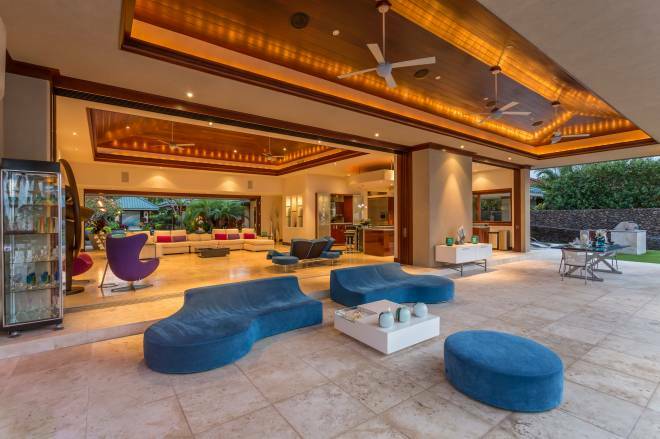 At night, light up the two large fire-bowls and four tiki torches to enjoy the tropical Hawaiian nights. 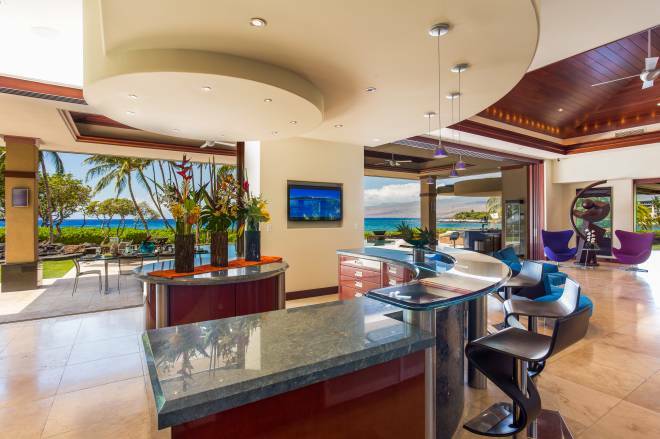 Mix a tropical drink at the circular wet bar, which includes icemaker, refrigerator, dishwasher, and TV on the ocean side lanai. Enjoy the additional Sunset Paradise Beach bar on the private sand point with fire pit while making s’mores and listening to music. Your stay also includes daily, light housekeeping. Rental electric GEM Cars are available, which are perfect for driving around Mauna Lani Resort. Pauoa Beach is an oceanfront community located between two luxurious hotels, the Fairmont Orchid and the Mauna Lani Bay Hotel. 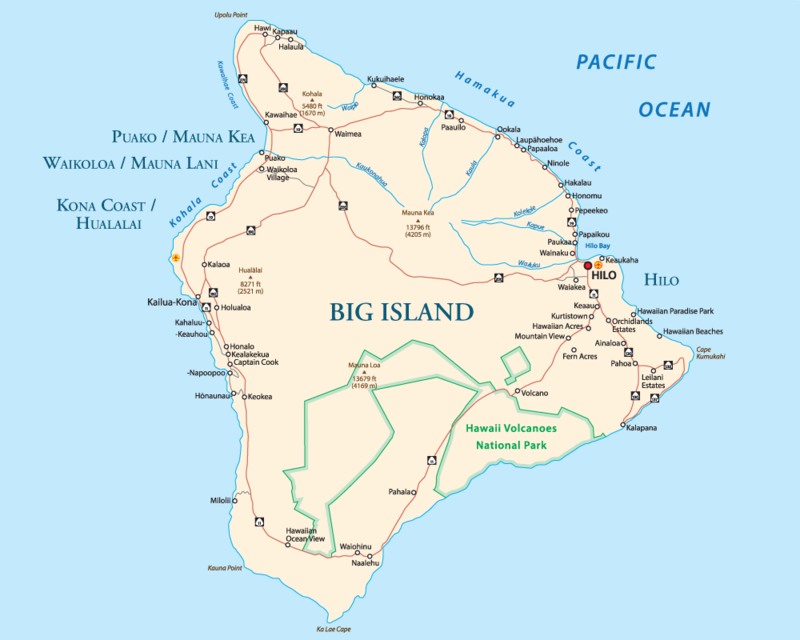 The warm climate on the Kohala Coast is one of the best in the island chain, warm and sunny with clear skies almost all days of the year. 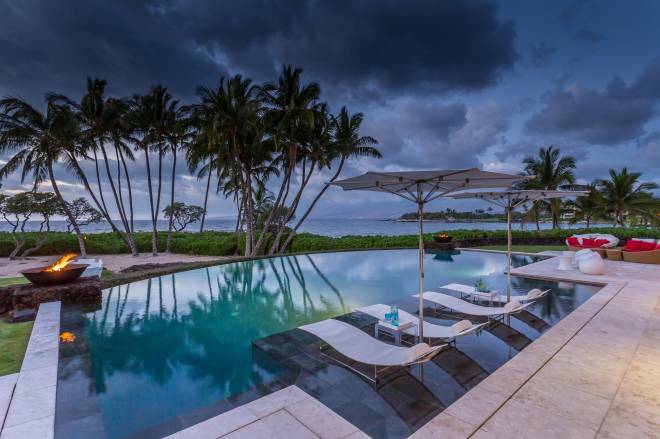 Pauoa beach is one of the most exclusive gated enclaves in the state and offers the highest levels of amenities, along with ocean front location. Facilities at the Pauoa Beach Club include a large, stunning negative edge pool, lounges, umbrellas, locker rooms, massage rooms, baby pool, sauna and fitness center. Paoua Bay, with its white sand beach and palm trees, is one of the most picturesque in Hawaii where sea life abounds. In the winter months, you may see dolphins and whales playing in the warm waters off shore. 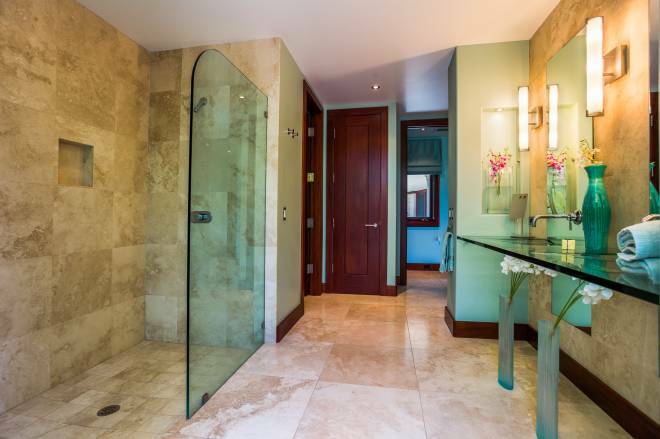 Within the resort, about a 10 min walk from this estate, The Shops at Mauna Lani offer a gourmet grocery market, Tommy Bahamas, Ruth Chris Steak House, Monstera Sushi and numerous coffee and smoothie cafes. Check out free cultural events at the Shops at Mauna Lani.